Every computer user should have faced the problems with Codecs sometimes or the other. 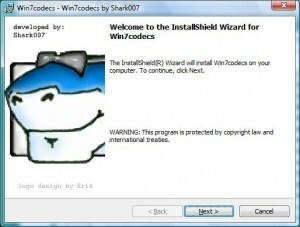 If you have recently installed Windows 7 and are facing some problem with Codecs then you can try Windows 7 Codecs Pack. The Win7codecs package does not change or interfere with Microsoft’s native codec support in Windows Media Player 12 and Media Center. The codec package just provides DXVA accelerated H264 playback for all other capable players. The Windows 7 package will automatically remove the other popular codec releases from your computer before installing this concise yet comprehensive package. The good thing is that you won’t need to make any changes or adjustments or tweaks to enjoy your media content. Windows Media Player and Media Center will automatically recognize all your files as playable. The Windows 7 installer package does not contain a media player and it does not associate any file-types. With this package installed you will be able to use any media player to play all your movies and video clips. Streaming video is also supported in several formats in all the popular web browsers. While installing Win7codecs you have the ability to choose what is installed and where to install it. The default is English and the installer includes support for the following other languages; Chinese Simplified/Traditional, Japanese, French, German, Greek, Italian, Czech, Dutch, Finnish, Norwegian, Portuguese, Polish, Swedish, Russian, Spanish and Turkish.